I read this article and found it very interesting, thought it might be something for you. 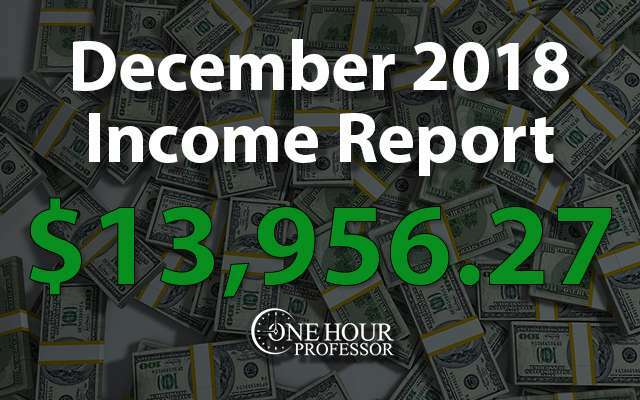 The article is called December 2018 Monthly Income Report and is located at http://www.onehourprofessor.com/december-2018-monthly-income-report/. December has officially come to an end and with it, the end of 2018. The month itself was actually very good. Typically, in the month of December I expect my income to dip because traffic to my websites almost always slows down. While the traffic to the websites did slow down, I have a product on Amazon with the BCC website that made up for the typical lost revenue that I see at the end of the year. I plan to do more diversifying in 2019 using Amazon FBA services as this was a nice proof of concept to what I was envisioning previously. This month my total income after expenses was $13,956.27 which comes out to $450.20 per day. December was as busy as any other month when it came to my personal life. Because my wife is still in Brazil, most of my time was spent with friends and family. I had a few parties to attend, and purposely disengaged from my work for the last week of December. It was nice to get a breather and reflect back on everything that’s going on. The house that we recently purchased is still coming together, but it’s a pretty frustrating experience. To sum everything up, my wife has a large amount of money in Brazil that were having a very difficult time moving to the US. This money is to be used to complete all of our renovations and obviously without it, nothing is getting done. I’ve been able to do a few little projects, but they still quite a bit to do and I’ve given up trying to do anything until we get our large projects out of the way. We’re hoping that she’ll be able to get here in January, but immigration has officially screwed up some of the paperwork and now we’re waiting to hear from them. That all said, my business continued to chug along in December and this was by far my greatest year yet. I was able to more than double my annual income and I really hope that trend will continue in 2019. 2018 as a whole was a pretty darn good year. I was able to hit some of my goals and completely missed on other goals. However, the most important goals of making more revenue and growing I was able to exceed so I’m obviously pretty happy about that. It’s pretty crazy to look back at the year considering there were so many different things I was involved in and it seems like every day is flying by. I guess this is because I like what I do and I put a lot of work into making sure I stay busy every single day. From a pure numbers perspective, this year was outstanding. My traffic across all websites except for OHP continued to grow. I think the most exciting thing is to see the growth with the CK website considering how much of a focus that’s been this year. I actually don’t plan on taking my foot off the gas pedal in 2019 and really want to make this website much bigger than it currently is. The BCC website had some surprising growth considering I felt like I didn’t do much at all in 2018 for it. Looking back, I definitely did create more blog content and this obviously had an impact. The growth on the JFTHQ website more than doubled and I think will continue to rise as well. As of now this is a pretty passive project, but I’m still trying to get as much traffic as possible and there’s a lot of room to grow. The JFFH website, which has been my bread and butter for some time, also was able to grow. Though the percentage increase wasn’t nearly as large as my other projects, 24% growth at that large of a number is significant and resulted in just under 500,000 more sessions. TJHQ and OHP I don’t really focus on growing so I’m not all that concerned with their numbers. It was nice to see the small growth with TJHQ and I think OHP is probably hear more for me than anybody else. 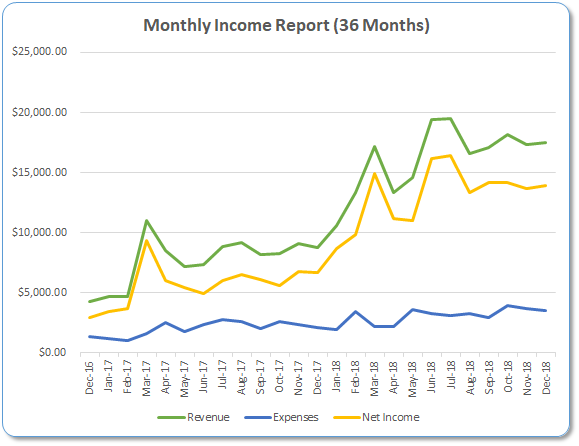 Though traffic is always an important stat when looking at an online business, income is undoubtedly much more important and you can see I had an awesome year from that perspective. Most notably, the CK website increased exponentially as did BCC and JFTHQ. The growth of JFFH was smaller, but still very significant because this is my income leader in my portfolio. FAIL: While I really had high hopes for this website, I’m not even close to this number. I still think good things will happen and I could eventually get to this scale, but it’s going to be a few years until that happens. FAIL: I intended on creating more FBA products by piggybacking off of the success of the CK website, but obviously that didn’t happen. That said, I think that this is a much more realistic goal in 2019, though I don’t know that I’ll shoot for $100,000. SUCCESS (Overachieved) : I actually was able to create two new websites in 2018 and don’t intend on creating any new ones in 2019 at all. Right now I have my plate full with my current workload and I’ll either need to sell one or find a better way to manage my current portfolio in order to create anything else. SUCCESS (Overachieved): You’ll notice that originally, I was intending on reaching 15,000 per month in business revenue. I’m happy to report that in the month of 2018 I was actually able to hit over $15,000 per month in income, which was far better than I expected. FAIL: I’m not really too sure why I was so focused on creating reviews for products. I understand that the OHP website could be making more money, but I have confidence that the other projects I’m working on could far exceed the ceiling of this one. Grow my CK website to over 150,000 pageviews monthly: I’m still going to focus on this goal, but I’m changing users to page views in hopes that I can make the website more “sticky”than it currently is. As of right now I’m able to get over 70,000 page views each month but the people are coming back. I need people to come back and I think that I’ll be able to do this through a number of different steps that I already have plant. Create Physical Products and Sell over $15,000 using Amazon FBA: I need to create more physical products in 2019 but the only way that I’m going to be willing to do this is if I’m already ranking for the review posts about these products. For example, if I had a coffee website and ranked #1 for “Best Coffee Mug”, then I would create a new coffee mug and sell it on the post. I was able to do this on the BCC website with a product I created and it went incredibly well. Now, I just have to scale the strategy and make it so that the CK website will start ranking for its review posts. I’m not really sure how I’m going to go about doing that yet, but hopefully Google will show me some love and I can really get going with physical products. Earn $20,000 Per Month in Business Income: Truthfully, I have no idea how I’m going to be able to do this. I’ve got a few websites to grow in 2019 that I’ve already begun building and I need to sell physical products more often. Other than that, I’m not really sure what I’m going to do but will see what the year brings. That pretty much sums up the year and my goals for 2019. It won’t be easy, but I think I can achieve all of these goals because of all the different things I already have in place. BCC FBA Merchandise Sales: The only real outlier that I saw for income in December was my FB a merchandise sales. To be honest, I was very surprised at how well the merchandise is doing and intend on adding more to it in 2019. The problem with this merchandise is that it’s very seasonal and usually only sells around the holidays. I’m going to try to make a product or two that can sell year-round so that these dips don’t happen, but it was nice to make an extra thousand dollars this month considering income usually drops. CK Website Income: The CK website continues to grow and for the month of December it was able to increase earnings by 20%. This is mostly due to Google AdSense, but I’m still trying to rank affiliate review content unsuccessfully. I’m slowly dripping out there to see what else I can do, but I’m very hopeful that in time I’ll be able to rank review content for this website and this will result in significant increases in income. Incorp Services: I’d say that the only real surprise I had this month from expenses is the corporate fees I have to pay to this company. Every year I have to have a registered agent and that’s what this fee is for. JFFH Update: In December, there was a small decrease in traffic to this website and I’m not necessarily alarmed by that. This time of year is always slow for this website and I think that the decrease was typical. That said, I have noticed a new competitor pop up against this website and it’s actually someone I’ve been keeping an eye on for some time. They’ve essentially copied my website and try to make something better and while it does look nicer, the content on my website is far better. But, I definitely can’t snooze on this competition. This is someone who actually knows what they’re doing and has put a team in place to help. I’m going to have to spend a lot of time looking over my website and finding ways to make it better. I already know how I’m going to be able to do this and have some things I’m working on, but it’s going to take some time to get everything sorted out. As of now, I intend on increasing the amount of information available in crucial places and doing whatever I can to beat them in this niche. Consulting Update: I officially signed up a new consulting client to work with me on a monthly basis for the entire year 2019. While I don’t typically do these long-term engagements, this is somebody who I’ve known for some time and their business could really use my help, so I’ve agreed to temporarily join their team. It’s not going to be a ton of hours each week and I think that my guidance is needed more on a strategic level than anything else. That said, the extra income will be nice and I’m confident I can help them. Udemy Update: I saw a small drop in income here and that’s totally fine. At this point I do nothing on this platform and it continues to give me revenue each month. OHP Website Update: I am all but giving up with the idea of creating this into a financial website. My potential partner has backed out because of her employer and after the most recent algorithm update I don’t want to dive into a financial website anyway. I could probably create a lot of reviews on this website and start to make more money, but I think that I can make a lot more money in other areas and future projects. So last month I discussed how bad I screwed up on this website by accidentally implementing a no index, no follow tag across the entire website. I’m happy to report that the website has definitely bounced back from that and though it’s not at its previous levels, it seems like things are looking up. As of now all I continue to do with this website is try to get more back links and I have a writer creating two blog posts per week. It’s pretty much on autopilot at this point and I hope that my efforts for back linking will get the website more traffic in the future. I found a way to have backlinking through guest posts, as well as general backlinking to the homepage. I’ve outsourced the projects as much as possible and now I’m just managing the processes. There was a small dip in referring domains for the month and I’m not really sure why that is. I actually saw this across most of my websites so I think there was some type of correction that Google implemented. Earnings increased from the prior month which was very welcome news. I’m hoping that January will be better than December and considering the nature of this website, I’d be willing to bet that will be true. The only notable news for this website is the fact that I was able to sell merchandise to my audience and made over $1000 this month doing so. In total, the merchandise cost around $1500 to create and now I’ve made a total of $1800, so I’m already in the green and have a lot of inventory left. If the rest of the inventory sells through, I’ll probably make another $1800 or so. Not too bad for a small product that I put very little effort into. Next year and going to make sure that outsource the design of the product to make it even easier on myself. I’m pretty confident that the only way to really grow income for this website moving forward is to sell physical products. That isn’t very easy to do only because I have to find people who can create the products and then send them all into Amazon to get listed. But moving forward, I think this is the main strategy for this website because I don’t have too much else I can write about. In terms of the search engine “monopoly” I referred to last month with this product, it’s still in place. As of right now if you search this product in Amazon, I’m the number one result. If you search on Google, I’m the number one product result (information pulled from Amazon.com listing) and I also have the number one organic result to my own website. This is definitely the sweet spot and as long as nothing changes, I shouldn’t have a problem selling through these items. This was far and away my best month and the merchandise I have continues to sell. It is a product that is seasonal and won’t be selling throughout the whole year, but hopefully I’ll be able to sell all of my units by the end of March. Another month has passed and the CK website continues its steady growth trajectory. This was a difficult site as it went really far up in the beginning and then fell significantly, but now it’s starting to steadily climb month after month. The problem though is that I created a database for this website and right now it’s almost as if Google sees me as the resource only for information related to that database and not anything else. This is why none of the review posts are ranking. In fact, most of my blog posts also aren’t ranking and though I think that they are on par or better than my competitors, it just isn’t happening yet. I still think it could happen and I may have to build a few links directly to the pages of my reviews, but hopefully I can make this a reality in 2019. If I do, I already have plans on how I’m going to create multiple Amazon FBA products and sell them by using my own website as the main source. The thing though is that I have to get a few “search engine monopolies” on some products in order to do this. I already created a review post for one product that I could easily create which has tremendous potential, but that post is nowhere to be found in Google. I’m working to change that, but I’m not sure how it’s going to work out yet. Consistent growth is occurring. Granted, it’s not necessarily hockey-stick growth, but the slow and steady rise of traffic to this website is very encouraging. This was my highest earning month yet for the website. I think this will continue and am hopeful I can reach $1000 a month in the next 3 to 4 months. You Will Get Competition: It’s not that I’ve been ignoring my competition for the JFFH website, but most of them paled in comparison to what I had developed. My new competition is definitely a worthy adversary and I’m going to have to work hard to make sure they don’t overtake me. Guest Posting Can be Outsourced: It took me quite a bit of time to figure out how to do this, but I’ve got a nice way of prospecting, pitching, and guest posting without much effort at all on my end. I considered this to be one of the harder tasks to outsource, and I can’t wait to roll it out across all of my websites in the coming year. Search Engine Monopolies are Incredibly Lucrative: I didn’t know how my merchandise would sell for the BCC website in December, but I did know that I did everything I can to set myself up for success. That said, the fact that I’m number one in Google and Amazon has proven to be very lucrative even with a product like the one I have which is very small and not that difficult to create. I intend on doing this more in the future and if I can, it’s possible that each product could mean an extra $1000 a month or more in my pocket. There’s some crazy money out there in physical products, and I really want to get a piece of it. I was able to publish one new review post on the CK website and also published one on the BCC website. I originally intended to do both on the CK website, but when one doesn’t rank it really stops me from posting another as I don’t want to waste my time and effort. I’m going to work hard to try to rank the CK review posts which will hopefully get me more eyeballs to the pages, which will mean more income. As you see in the report, I had no problem setting goals for 2019. Last year I went with some pretty lofty and unrealistic goals but this year I want to dial it back and focus on attainable goals. I would say I did a better job of relaxing in the month of December as opposed to working on the house. Sure, I did get some small projects done but there’s still a lot to do. What Are my Goals for January? The email opt-in on the CK website needs to be better than what I currently have so I’ve decided to revise it to make it more effective. Email lists are so incredibly important and the only way I think I’ll ever make a lot of money with this website is by having a good one. The issue with review posts is that eventually products listed become outdated. Either someone stops producing them or Amazon doesn’t rank them anymore, but sometimes the stock runs out and the product listing page goes away. When that happens, you need to replace it with a new product and the BCC website needs a lot of these revisions. The JFFH website needs some revisions to keep up with the competition and I intend on completing those revisions in January. I know exactly what I need to do and I already have my developer ready to do it, I just have to make the work requirements and assign it. My developer is finishing up a project on my new website to get it where I need and then I’m going to officially launch this one. The nice thing about this website is I already have about 30 articles ready to go that are ready to be published, but I just need to get some development work completed first. I’m not sure exactly how much traffic this website will bring in the short term, but I know long-term and has a lot of potential. so do you teach a course to basically to learn how to make the money you show on these reports? I’d never promise you’ll make the same amount I do, it took a lot of hard work to get here. But yes, my course does teach you the foundations of making a living online and helps you figure out the steps necessary to succeed. You had a great 2018. And I certain you will definitely see much more increase in your businesses in 2019. I am wondering if your traffic are purely organic? Or do you also do anything to bring in social traffic? About 90% of my traffic is organic across all website. I’m working in 2019 to get Pinterest to become more of a factor, but it’s mostly SEO. Thank you for your reply. I am building some websites that will get their traffic from google. And I am definitely going to look into social traffic as well.